BACKGROUND: Definitive primary abdominal closure is often not possible nor desirable following trauma laparotomy. In such situations, temporary abdominal containment (TAC) is necessary. This audit reviews our experience with TAC and interrogates our use of the Vacuum Assisted Mesh Mediated Fascial Traction approach (VAMMFT) to achieve delayed closure of the Open Abdomen (OA). METHODS: We conducted a retrospective study over a 4-year period of trauma patients who underwent a trauma laparotomy and who required a TAC. RESULTS: Over the four-year period, 596 patients underwent a laparotomy for trauma. Of these trauma laparotomies, 463 (78%) underwent primary closure and 133 (22%) required a TAC. Of these 133 patients who required a TAC, 37 died, 41 underwent delayed primary fascial closure at repeat laparotomy and 55 were left with an OA. Of this cohort of 55 patients, 15 underwent a VAMMFT procedure. The VAMMFT procedure yielded a 60% closure rate, with failure to close being due to late mesh insertion and sepsis. CONCLUSION: Our initial results with VAMMFT are encouraging. The technique appears to be effective and safe. Ongoing audit will allow us to accrue more patients and to better refine our algorithms and strategies. Key words: Vacuum assisted closure, Surgical Meshes, Occlusive dressings, Surgical Closure Techniques, Ventral hernia. Definitive primary abdominal closure is preferred for all abdominal surgery; however, it has been increasingly recognised that primary closure is often not possible nor desirable following trauma laparotomy.13 In such situations temporary abdominal containment (TAC) is necessary.4,5 If delayed primary closure cannot be obtained quickly and efficaciously, the patient is left with an open abdomen (OA), which is a morbid condition. With the increased recognition of the need for TAC there has been increased interest in the management of the OA.5,6 Initially TAC was achieved by the use of low cost, sterile plastic being sutured to either the sheath or to the skin. This became known colloquially as the Bogota bag.4,5,6 The Bogota bag, however, had a number of limitations. It allowed the sheath to retract, making it difficult to close the abdomen at a later stage, and allowed intra-abdominal fluid to egress freely so necessitating frequent dressing changes. In addition, patients in whom a Bogota bag was applied were frequently left with a large ventral hernia. In response to these problems, two broad strategies have been employed to manage the OA and to try and achieve delayed closure. These are traction type devices designed to pull the edges of the fascial sheath together and vacuum type devices designed to facilitate fascial closure and remove egressing fluids from the wound.7,8 The development of sophisticated vacuum assist closure devices has allowed for better wound management and for better closure rates according to a number of authors.9,10,11,12,13 A further technique has been described which combines both negative pressure and traction and this is known as the Vacuum Assisted Mesh Mediated Fascial Traction (VAMMFT) approach.14,15 Our institution has used a modified VAMMFT approach for the last two years. In light of this, we set out to audit our experience with the OA and with our modified VAMMFT approach. We hoped to benchmark our outcomes and to use this data to refine our current management algorithms and strategies. In Table 1, we compare different closure techniques and closure rates, with VAMMFT. As our protocol is refined, improved closure rates should be achieved. The study was based at the Pietermaritzburg Metropolitan Trauma Service (PMTS), Pietermaritzburg, South Africa, and focused on trauma patients who had an OA, as part of their care at our institution. The PMTS provides definitive trauma service to the city of Pietermaritzburg, and parts of Kwa-Zulu Natal (KZN) province. The PMTS maintains a formal regional trauma registry (HMER). All patients who present to our trauma center are prospectively entered into the database, and the information entered includes details regarding injury mechanism, operative intervention, patient progress and clinical outcomes. Ethics approval for the maintenance of this registry for both clinical care and research has been formally endorsed by the Biomedical Research Ethics Committee (BREC) of the University of Kwa-Zulu Natal (UKZN). The ethics number is BCA 221/13. The HEMR was retrospectively reviewed for the four-year period December 2012 to December 2016 and all patients who required an OA following a trauma laparotomy were identified and reviewed. We use the following definitions when discussing the OA in our institution. Primary Closure: refers to definitive closure of the sheath and fascia following the index laparotomy. Primary Temporary Abdominal Containment (TAC): refers to the use of a TAC device following the index laparotomy. Delayed primary fascial closure: refers to fascial closure achieved in hospital at repeat laparotomy without recourse to a device. Secondary Closure: refers to all patients who had had an open abdomen closed prior to discharge from hospital with the assistance of a device. Open Abdomen: This describes the patient who has required TAC and whose fascial edges are not yet approximated. Ventral hernia: refers to all patients who leave hospital with a primary fascial defect covered by a skin graft or granulation tissue which requires delayed closure at a future date. All patients who require emergency laparotomy for trauma are resuscitated and expedited to the operating room. TAC is indicated for all damage control operations and all patients where primary closure is not technically possible due to loss of abdominal wall substance or due to gross abdominal swelling and physiological compromise. If TAC is required, the so-called "Bogota bag" approach is used. A plastic vacolitre bag is opened and sutured with a continuous large nylon suture to the skin. A vacuum dressing is applied using suction catheters which have side-holes cut in them. The catheters are applied to the surface of the bag and secured with an occlusive transparent dressing. Wall suction is applied at 50 mm Hg. The suction functions by removing effluent that egresses from the wound and abdominal cavity and is placed on top of the Bogota bag to prevent direct suction on bowel and increasing the risk of fistula formation. The Bogota bag approach is used in our institution as it appears to be more robust and durable in our environment than the Opsite sandwich, which is associated with a risk of evisceration during patient movement. Once a patient has undergone a TAC, we return to the operating room within 48 hours with the intention of achieving delayed primary closure. If delayed primary closure is not possible then the patient per definition has an OA. Prior to the introduction of VAMMFT management was individualised. If delayed primary closure could not be achieved within a week then the wound was allowed to granulate. This resulted in a large ventral hernia. Since January 2016 we have adopted the VAMMFT approach as described by Rasilainen and colleagues,14 to patients with an OA. This uses, a commercial vacuum-assisted wound closure system (V.A.C. Abdominal Dressing System; KCI, San Antonio, Texas, USA) in conjunction with a non-absorbable mesh, which is sutured to the fascial edges and gradually tightened. This combines negative pressure with fascial traction. All patients who require TAC are subjected to repeat-laparotomy within 48 hours with the intention of achieving delayed primary closure. If delayed primary closure cannot be achieved, Vacuum Assisted Mesh Mediated Fascial Traction (VAMMFT) is employed at re-laparotomy. A perforated polyethylene sheet is placed intra-abdominally to cover the viscera and then an oval-shaped polypropylene mesh is sutured to the fascial edges with a continuous monofilament suture. The mesh is run with non-absorbable sutures in a shoe lace type style for future tightening. A thick polyurethane sponge is placed over the mesh and the entire wound is covered with transparent occlusive sheets. The occlusive sheet is then perforated in the middle and linked to a suction device with continuous topical negative pressure. Once the VAMMFT device has been applied, the patient undergoes serial tightening in the ward every 48 hours, using a sterile pack and new vacuum sheets. As soon as sheath approximation is achieved, the patient is scheduled for closure in theatre. At the time of delayed closure in theatre, a lateral release procedure can be performed to ensure a tension free sheath closure. The skin should be loosely approximated with sutures and a vacuum dressing placed across the wound. Mesh removal is indicated in the following situations: • In patients whose physiological state precludes resultant increase in intra-abdominal pressure, e.g., poor respiratory efforts or ongoing physiological problems where serial mesh tightening can lead to abdominal compartment syndrome. Sheath friability with mesh tearing from tissue and resultant sheath damage. Continuous variables were expressed as mean and standard deviation and were compared with the ANOVA test; categorical data were expressed as proportions and were compared with the Chi-square test. Linear associations were tested with the Pearson's linear correlation model. All the statistical analyses were performed with IBM SPSS 20 (IBM Corp. Released 2011. IBM SPSS Statistics for Windows, Version 20.0. Armonk, NY: IBM Corp). During the four-year period under review a total of 596 patients underwent a laparotomy for trauma. The mean age was 29 years. 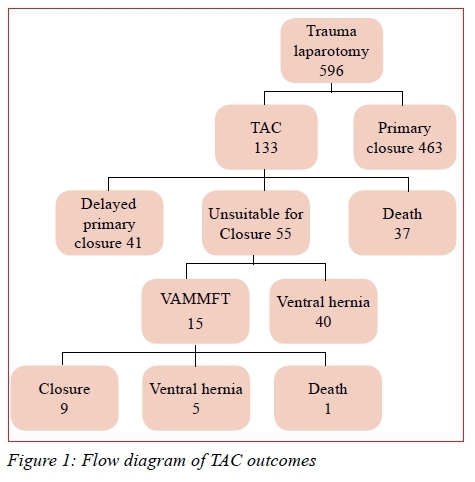 Of these trauma patients undergoing a trauma laparotomy, 463 (78%) underwent primary closure and 133 (22%) required a TAC (Figure 1). In Table 2 the mechanism of injury is divided in penetrating (PT) and blunt trauma (BT). Of all the patients requiring exploratory laparotomy, 471 (79%) sustained penetrating trauma whilst 118 (20%) sustained blunt trauma and 7 (1%) sustained a combination of blunt and penetrating trauma. Of the blunt trauma (BT) group 37 (31% of all BT) required TAC whilst 96 (20% of all PT) penetrating trauma required TAC. Table 3 compares the presentation physiology of the patients who required TAC and those who did not. By and large patients requiring TAC were significantly more likely to be shocked and acidotic than those who underwent primary closure. Heart rate, lactate and bicarbonate levels were significantly deranged in patients requiring TAC. A total of 36% of patients requiring TAC were shocked, compared to only 13% in the primary closure group. 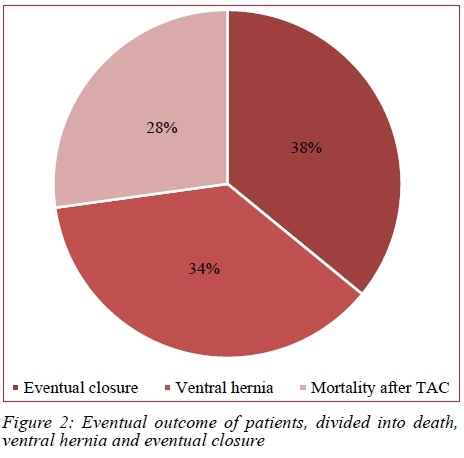 In total, 50 patients (38%) were discharged with fascial closure having been achieved after primary TAC and 45 patients (34%) were discharged from hospital with a ventral hernia. A total of 38 (28%) patients died in hospital. Figure 2 breaks the cohort down by death and by ultimate open abdomen management strategy. There were 41 (31%) patients in whom delayed primary closure was achieved at repeat laparotomy and there were 55 (41%) in whom this was not possible. Of this cohort of 55 unsuitable patients, as well as some patients that had primary closure but who subsequently required an OA after repeat-laparotomy, 15 were subjected to the VAMMFT approach. VAMMFT yielded a 60% (9) closure rate in the 15 patients in which it was instituted. The VAMMFT system was inserted on average by day 11 post index laparotomy. By this stage it had become clear that we would be unable to achieve delayed primary closure. Tightening was undertaken every alternative day until the fascial edges were sufficiently approximated to achieve delayed fascial closure. Mesh tightening was performed on average 5 times per patient. It then took a further 12 days of tightening to achieve closure. Each patient ultimately required between 3 to 6 laparotomies to achieve source control and the average length of stay in hospital was 45 days (ranging from 21-103). Of the 5 VAMMFT failures, intra-abdominal sepsis accounted for 2 and protocol violation a further three. Protocol violation included not inserting the mesh early enough, or removal of the mesh by surgeons not familiar with the technique at repeat laparotomy. In the final protocol, it was determined that mesh insertion should be done at the relaparotomy if delayed primary closure is not possible. Of the failures due to sepsis 1 patient developed superficial wound sepsis and sheath friability before closure and one patient developed deep sepsis with an intra-abdominal pus collection. No entero-atmospheric fistulae developed in this group. The overall mortality in this group of patients who underwent a trauma laparotomy was 52 (9%). The mortality rate in those who required a TAC was 37 (28%). A total of 104 patients underwent a damage control procedure. Of these 77 (74%) required a primary TAC. A total of 34 (33%) of the damage control group died and 24 (23%) underwent delayed primary closure. The increased use of damage control principles in trauma and increased awareness of the abdominal compartment syndrome means that surgeons frequently resort to some sort of TAC strategy in the acute management of trauma patients.4-8 Table 1 attempts to summarise our experience and compare it with that reported in the literature. Our data shows that TAC is more likely to be needed in patients who are shocked and acidotic and who require damage control surgery.13 The need for a TAC is associated with an increased risk of death and need for ICU as would be expected in a cohort of shocked and acidotic trauma patients. Once TAC has become necessary the spectre of an OA and of ventral hernia is ever present unless delayed closure is possible. Our results suggest that this is only possible in less than fifty percent of patients who require a TAC. In light of this, strategies need to be implemented to reduce the ventral hernia rate. We cannot afford to use commercial devices on all patients with a TAC and we therefore reserve these devices for patients in whom delayed primary closure cannot be achieved at the first repeat laparotomy. The VAMMFT technique has a 60% closure rate in our hands and appears to be effective and safe.14,15 Our initial experience is encouraging and has helped us refine our algorithms. Ongoing audit will allow us to accrue bigger numbers and to further clarify the role of this technique in the management of these patients. This study has a number of limitations, many of which bedevil almost all reports on this topic, namely the retrospective nature of the report and the lack of prospective randomisation. This was a new technique introduced in an ad hoc basis for select patients. As confidence with this technique has developed and we have gained experience, it seems likely to become part of our armamentarium. Just under one quarter of patients who undergo a trauma laparotomy require TAC. Damage control surgery remains the most common indication for a TAC in trauma. Once TAC is necessary about 40% of patients will ultimately be left with a ventral hernia. We have adopted a selective VAMMFT strategy to achieve secondary closure. Our initial results with this approach suggest that this is effective and safe.